August 1, 2017 – Beyond Monumental, the non-profit responsible for the CNO Financial Indianapolis Monumental Marathon, along with Teacher’s Treasures, a non-profit which provides school supplies to high need Marion County schools and their teachers, are excited to announce that Arsenal Technical High School is the winner of the 2016 Teachers’ Treasures Monumental Matchup. The Teachers’ Treasures Monumental Matchup was initiated in 2016 as a program where participants of the CNO Financial Indianapolis Monumental Marathon, Half Marathon or 5K select a school that they would like to support during registration for the event. The school that receives the most participants supporting them was declared the winner. Over 300 participants selected a school to support in 2016. For their victory, teachers from Arsenal Tech were awarded with a surprise visit from the Teachers’ Treasures mobile outreach program. This allowed over 100 teachers to select supplies for their classrooms for the new year, free of charge. Supplies provided included notebooks, hygiene kits, paper, glue sticks, pens, staplers and a wide variety of other classroom items. Additionally, Teachers’ Treasures donated 100 backpacks for students who may not have one of their own. The total value of the outreach event exceeded $16,000. The Monumental Matchup will take place again in 2017. Anyone who wishes to support a school can do so during the registration process. The CNO Financial Indianapolis Monumental Marathon will celebrate its 10th anniversary on Saturday, November 4. Registration is open now. Beyond Monumental provides the Indianapolis community with a complement of activities built around its premiere event that promotes healthy living & fitness for all ages (both runners and walkers.) Beyond Monumental gives back to the Indianapolis community by supporting youth programming that reinforces healthy lifestyles for young people, with an emphasis on working with urban students and Indianapolis Public Schools, donating more than $875,000 in eight years. The CNO Financial Indianapolis Monumental Marathon is a top 20 marathon in the US and is nationally recognized by Runners’ World as one of “Ten Great Marathons for First Timers. 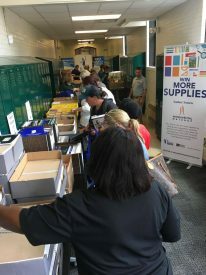 Teachers’ Treasures is an Indianapolis-based not-for-profit organization that helps at-risk children get the materials they need to succeed in school by providing teachers with donated educational supplies for use by their students in the classroom. Approximately 4,150 teachers participate in the program selecting supplies monthly from the free store. Founded in 2000, the organization now serves more than 270 schools throughout the Greater Indianapolis area, and affecting the lives of 100,000 plus students annually.